Two new studies reveal even more benefit to maternal exercise, from lowering risk of congenital heart defects to decreasing incidence of metabolic disorders in boys. Prenatal yoga. Belly bump boot camp. Aquamom water aerobics. 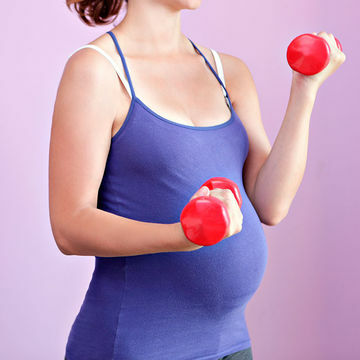 We all know a little exercise can do wonders for most pregnant women. But if you've been putting off being active, you might want to consider it for the health of your baby. Two new studies might just give you that added incentive to get back in to the exercise groove. In the first new study, researchers observed how pregnant mice that exercised notably lowered their chances of birthing babies with heart defects. This is very good news when it comes to our knowledge of fetal heart development, considering that as many as one percent of American babies are born with heart problems (most being minor, thankfully). Since it's already known that women of advanced maternal age—35 years and older—are more likely to have offspring with heart defects, researchers at the Washington University School of Medicine looked into what about a female's age caused the uptick in risk. The results, recently published in Nature, indicate that it's not the maturity of the ovaries and eggs but rather maternal age itself that makes the difference. Given this breakthrough, the research group decided to take a closer look at how metabolism might be to blame. After discovering that diet didn't really matter, they turned to exercise and placed running wheels in the cages of mice with a genetic predisposition to having offspring with heart defects. As perhaps hoped for, all mice that exercised effectively decreased their risk of having sick pups. "Exercise is well known to improve outcomes in many age-related disease in humans and animal models," says study author Patrick Y. Jay, M.D., Ph.D., an associate professor of pediatrics and genetics at the Washington University School of Medicine. But, as is always the case with animal studies, the application to humans is not cut and dried. "It is important not to jump to conclusions about how an experiment in mice applies to humans," Jay says. Still, childbearing-aged women might want to look at those wheel-running mice and consider the potential benefits of exercise when it comes to their own maternal and fetal health. Even just a brisk walk around the neighborhood can help. "Exercise in general has many benefits on health," Jay says. "To encourage physical activity, I think doing what you enjoy is way more important and effective than doing nothing at all." That being said, this experiment indicates that exercise needs to occur before conception in order to reap the benefits described. "The embryonic heart completes development by the tenth week of pregnancy, so exercise during pregnancy would not help prevent a heart defect," Jay adds. The mice had to exercise three months prior to becoming pregnant in order for there to be a detectable effect. Reason #2: It could lower your child's diabetes risk. In another new study, pregnant rats who were fed a high-fat diet before and during pregnancy lessened the likelihood of giving birth to babies with metabolic issues simply by exercising. The positive effects lowered the body weight, insulin, and blood glucose levels in offspring. This research, published in PLOS ONE, was conducted at the University of New South Wales, and discovered that male pups experienced a more dramatic benefit than females. In fact, the future risk of developing disorders like type-2 diabetes was also potentially reduced. How can you make a difference? Board-certified ob-gyn Jason S. James, M.D., recommends that physically active women remain so during pregnancy, "unless contraindicated by other prenatal concerns (such as premature labor or placental issues)." If you don't normally exercise, you should think about starting—even before you're pregnant. The good news is you don't have to run a marathon to make a difference—or lose any weight. "We were a little surprised at the size of the effects that we observed as the amount of exercise the rats did was modest," says Professor Margaret Morris, head of pharmacology at the School of Medical Sciences. "Our research seems to show that exercise had benefits in the offspring in the absence of any clear effect on weight gain in the mother." While running is a great form of exercise, it's not the only way to stay in shape during pregnancy. "The American College of Obstetricians and Gynecologists recommends at least 40 minutes of vigorous exercise most days of the week," James says. "This can include running, but other great options include lower impact exercises such as swimming, using an elliptical bike or cycling, pilates, yoga (though preferably not hot yoga), and even high intensity interval training such as CrossFit or boot camp, as long as exercises are modified according to recommendations for pregnancy. Essentially, any exercise that gets your heart running and can be sustained over a period of time can have great benefits in pregnancy—for mother and child." The only activity you might want to avoid while preggers? Scuba diving and anything with a high potential for contact, like ice hockey or basketball, or falling, like downhill skiing, says Jack Davidson, M.D., an ob-gyn with Cigna. And always ask your doctor before starting any new exercise regimen.